Welcome to the Technique Junkie Newsletter Design Team sneak peek blog hop! Today we are celebrating the launch of the NEW TJ Emboss or Die CD! This Cd has 79 pdf tutorials with ideas for getting the most from your Embossing Folders, Die Cut Machines and Electronic Cutters.The tutorials are in step-by-step format with pictures for each step and include fabulous artwork examples from the TJ Design Team. The CD is $17.95, and can be ordered directly HERE, on the sidebar of my blog, or even from the Technique Junkies home page. Pre-orders are being taken today, and the CD will be mailed the first week of March. This card uses one of the techniques on the CD: Faux Tooled Leather. This rich-looking technique really looks like leather in person! And it is easy, too -- you have to love that kind of technique. I know I do! 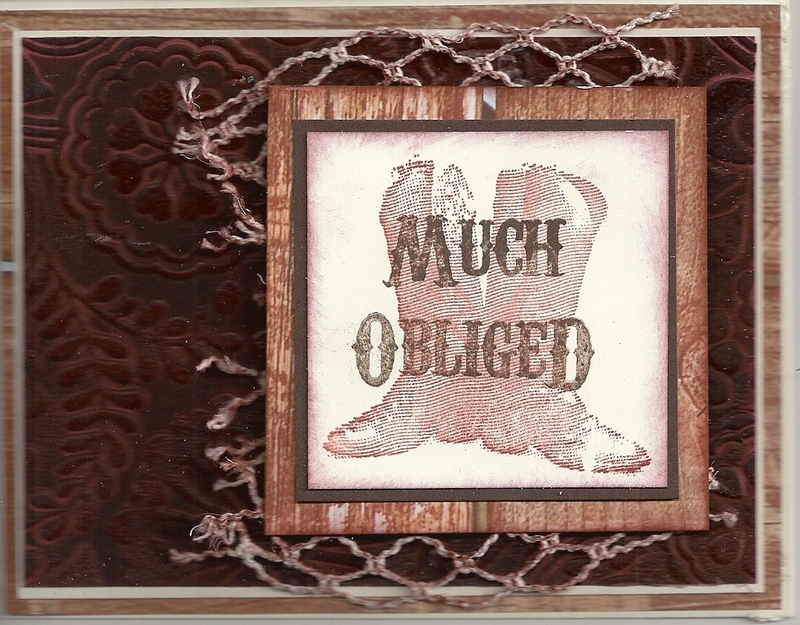 I hope you enjoy the sneak peek -- and make sure to get your CD ordered today! Happy Friday! Today is Blogger's Challenge day and our theme is Birthdays. 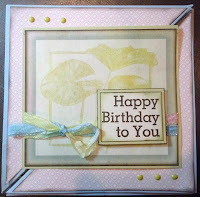 I love making birthday cards 0-- mainly because I never seem to have enough of them! Today's card is fun AND simple. 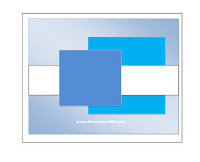 This is a Hip To Be Square Card from the Technique Junkie Newsletter Fancy Folds and Motion CD. Can you believe that it only took me 15 minutes to make it? 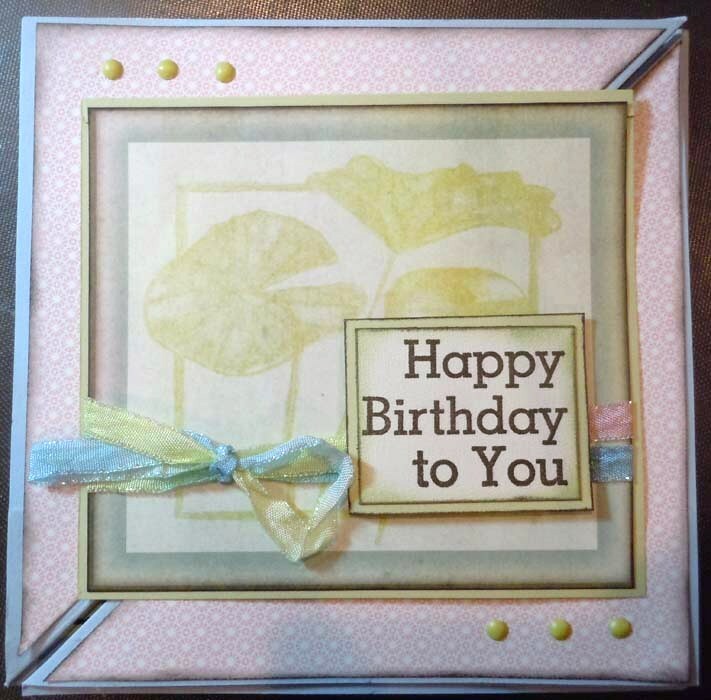 The paper and cardstock is from Club Scrap, the Happy Birthday and inside greeting are from smARTworks, and the cattails inside the card are from Mark's Finest Papers. I know these are not the best pictures -- it actually took me longer trying to get a good snapshot than it did to make the card! If you have a chance, take a look at what the other challenge players did, below -- then join in with your own work! I love digi downloads -- and better than that, I love having them at my fingertips. 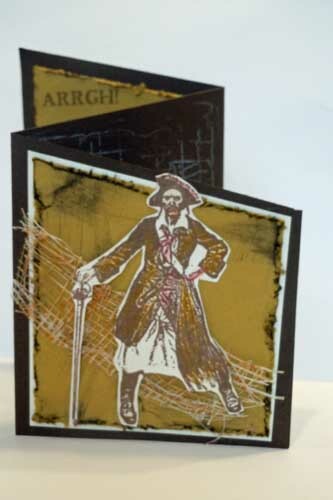 The image on this card is from Twisted Papers. I am proud to be offering the Twisted Papers Victorian Scrap CD for one lucky winner as our giveaway this week. The card above has a Salty Glimmers Background from the December 2010 issue of the Technique Junkie Newsletter. The main image was colored with colored pencils and pastel pencils, and highlighted with a gold pen. The background looks flat on the computer screen, but it is shimmery in person! 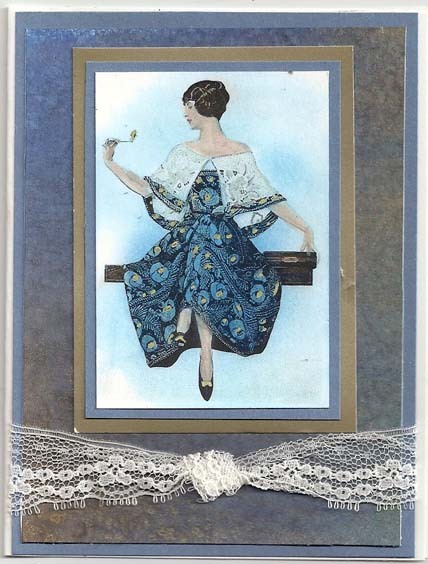 This collection is from a Victorian Scrap Album of the 1880s. Every item in the album has been scanned at 300 dpi, saved at actual size and painstakingly restored. 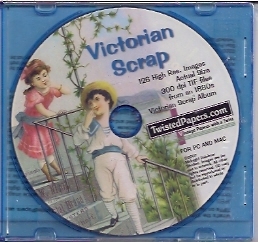 The 126 Victorian scrap images on this CD are in two formats professional-quality, high resolution 300 dpi TIF files and lower resolution JPG files for viewing on your computer monitor. They are ready to use on both PC and Mac platforms. To enter this giveaway for the Victorian Scrap CD and the card, please leave your name and email address in the comments on this post on my blog (do not email me your submission). I suggest leaving your email address as follows: p huntoon at optonline dot net. You do not need to be a subscriber to enter this giveaway. My random number generator will be selecting a winner on Friday, January 28st at 9:00 am. Congratulations to Brook G, the winner of this giveaway! I love the saying on this card. The stamps -- both the flowers and the saying -- are from from smARTworks. We all need friends to overlook our broken parts...and just love us for who we are, right? Thanks for taking time to admire my flowers! 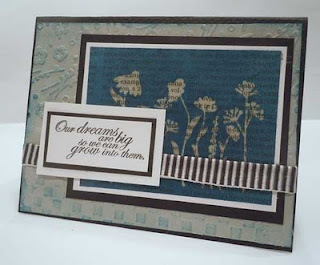 Today's Blogger's Challenge was to use Designer Paper on our creations. Couldn't be easier, right? 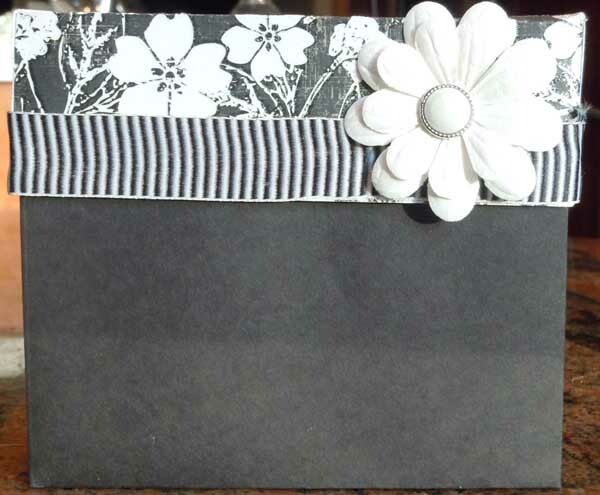 I made this Stationery Box from the Technique Junkie Newsletter Fancy Folds and Motion Paper Crafts CD a while ago, and for some reason, I never shared it! (I have to apologize for the dark picture -- I took this on my kitchen table. Red Granite is NOT the best surface for taking pictures). I love this paper -- it has specks of glitter and raised texture throughout, and it is stunning on the box! This box was a gift, and included the gift tags, pocket notes, and the 5 cards I made from the scraps left over from making the box. It is Easy to make, too! Don't forget, the Fancy Folds and Motion CD has 60 project tutorials in step-by-step, printable format -- with pictures for each step and plenty of examples for inspiration. It is only $17.95 -- for 60 -- yes SIXTY tutorials! Order using the link on my blog or here. If you would like to join the Blogger's Challenge, or even just take a peek at what the other players did this week, click on the links below my signature -- and play along, too! Short Accordion and a giveaway! I adore this little guy from Mark's Finest Paper. He just could not be cuter! He was the perfect size for this Short Graduated Accordion Card from the TJ Newsletter Fancy Folds and Motion Paper Crafts CD, too. All papers are from Mark's Finest Papers -- who is our giveaway sponsor, also! Mark's Finest Papers has been selling their self-branded stamp sets since January 2010. They have 56 full sets available, all made in the USA with photopolymer. There are two lines of stamps: Speedy the Cat's Designer Collection and the Two Big Boxers Collection. This set is from the Two Big Boxers Collection. Recently, the company owners acquired two Boxer puppies, Kittie Kat and Tom Kat. As part of their dedication to the health and welfare of animals, the company gives partial proceeds from the sales of the entire Two Big Boxers Product Line to support Free Spay/Neuter clinics on Florida's First Coast. Ready to order? Use this discount code for 15% off: TJ15NOW it is good thru January 25. To enter this giveaway from the stamp set above and the card, please leave your name and email address in the comments on this post on my blog (do not email me your submission). I suggest leaving your email address as follows: p huntoon at optonline dot net. You do not need to be a subscriber to enter this giveaway. My random number generator will be selecting a winner on Friday, January 21st at 9:00 am. Congratulations to Gail Cook -- the winner of this giveaway! One of the things I love best about the By the Inch Technique from the October 2010 issue of the Technique Junkie Newsletter is that ANY technique can be used for the collaged background. After 8 years of producing the newsletter, I have a HUGE drawer of cardfront-sized sheets of technique papers. It is a joy to pull a random one out and create something entirely new! 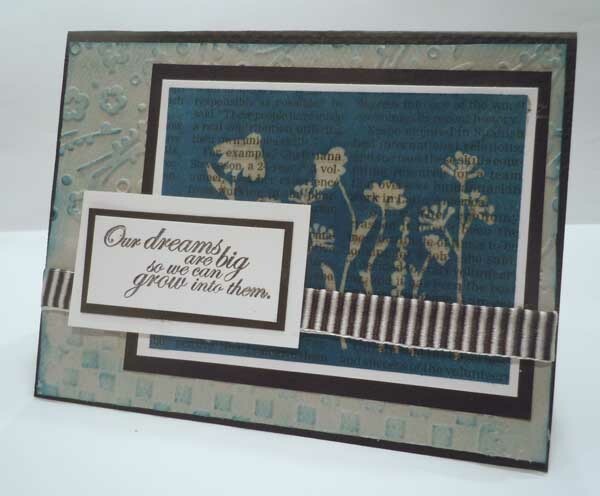 This By the Inch card uses stamps from smARTworks. The background was a piece of Silken Mist (October 2006) that has a gorgeous, subtle shimmer to it. I used 7 or eight smARTworks stamps to create my collage. 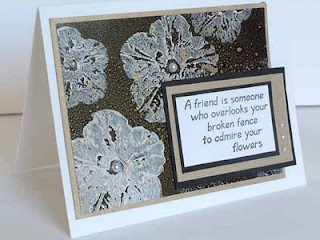 I added touches of silver, gold and some crystals throughout this card -- it is a shame I couldn't capture them with the camera lens. I made this card for the Frosted Designs Challenge. We are the sponsor this week! 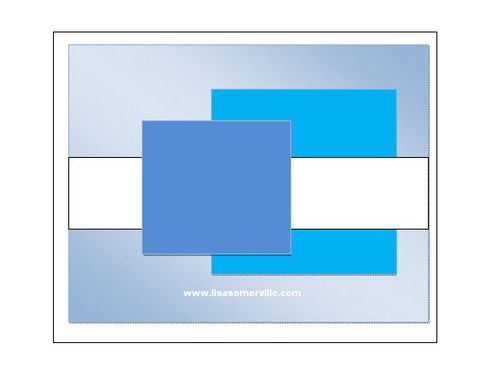 The challenge is to use paint in your design. Run on over there and join the challenge -- we are giving away a Fancy Folds CD and a one-year, online-only subscription. You can get in on the fun, too! 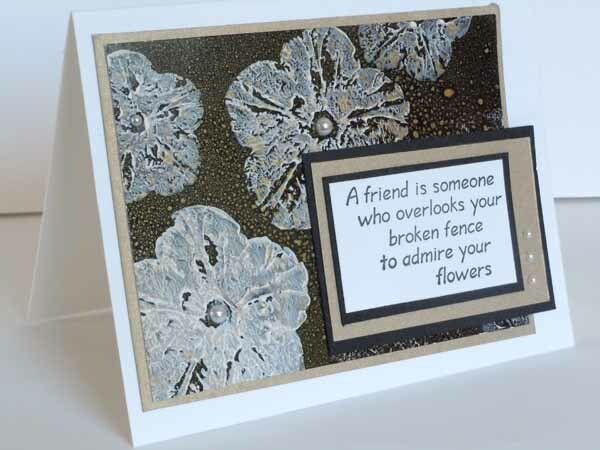 The card I made for this challenge uses the Acrylic Emboss Technique from the August 2010 issue of the Technique Junkie Newsletter. 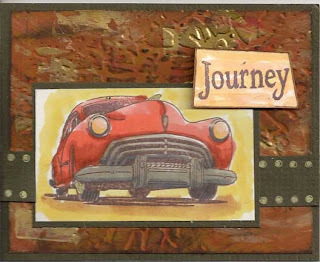 I use the cracked glass embossing folder over my painted piece, and layered my ribbon and car on that. The stamps I used are from My Paper Moon. I colored the car with Copics. I love the perspective on the stamp -- it is so unique! 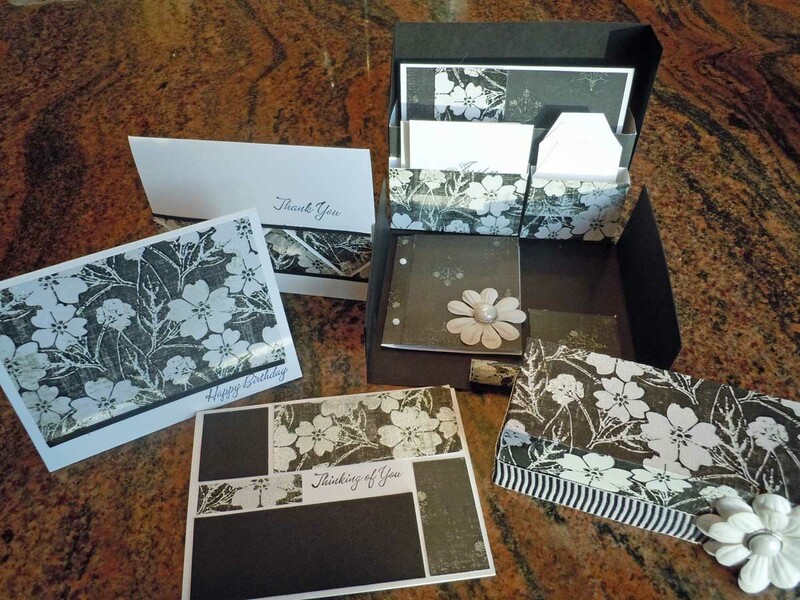 Run on over to the Frosted Designs Challenge Blog -- you could be a lucky winner! Yoo Hoo! I am finally playing in the Blogger's Challenge again. Today's challenge was a sketch challenge, and it was a simple one to boot! the sketch is on the right - give it a try! 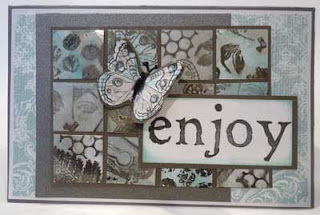 My submission for the challenge uses Sweet 'n Sassy Stamps on a piece of Newsprint Reveal from the April 2009 issue of the Technique Junkie Newsletter. That piece is layered over a piece of gray paper that uses the Texture Duet Technique (October 2010 issue of the TJNL). All papers are from Paper Temptress. 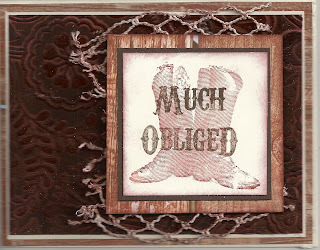 If you have a chance, click on the Blogger's Challenge link on my blog to see the creations from the other players. It is always a feast for the eyes! It has been a really long time since I have participated in the Technique Junkie Newsletter Try that Technique challenge...but it is a new year and with the new year comes a new resolve! If you are not familiar with the Try that Technique Challenge, it was started by TJ Design Team member Beth Norman, and Diana Enns, another long-time subscriber. Each week they select a technique and challenge you to try it. This week's challenge is the Aged Tiles Technique from the April 2008 issue of the Technique Junkie Newsletter. This technique was an egroup favorite -- and I remember why! Any stamp will work, and it is easy. You should give it a try! 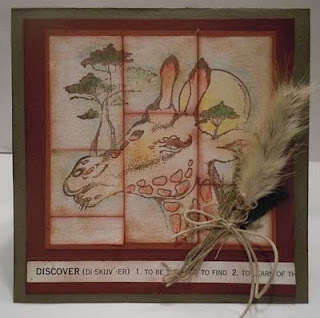 My card uses a giraffe from I Brake for Stamps layered over paper from Mark's Finest Papers. I found the grasses in my stash (um, that doesn't sound quite right to find grass in your stash, but as crafters, you know what I mean LOL), and I thought it added the right flair. A couple of years ago I found "pastel pencils" in the clearance aisle at Michaels. They look like colored pencils, but they spread like pastels. I LOVE them and love to blend them with my fingers. That is how I colored the giraffe. Take a moment to pop over to the TJ Design Team blog to see Beth's creation if you get a chance! She put a cool spin on it. Ahoy, matey! I think I have found the PERFECT card style for swaps. This card -- the Short Graduated Accordion from the Fancy Folds and Motion Paper Crafts CD --is it! These are very easy to make, put together, and they fit into a regular-sized envelope. Plus you get two cards from every piece of paper! 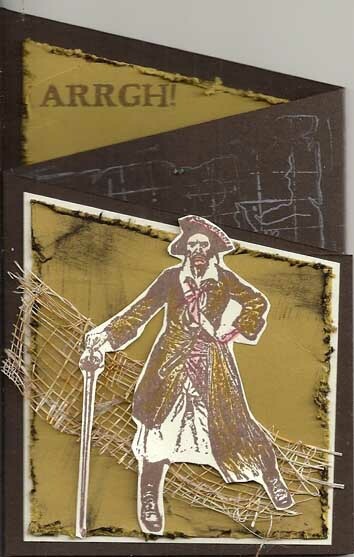 My Short Graduated Accordion Card uses paper from Mark's Finest Papers and features pirate images from Alluring Impressions. A great kids card, to be sure. If you need to still order the CD, you can order it directly from the link above, or from the Technique Junkie Newsletter home page. Okay, off to go swap the decks. Have a great day! 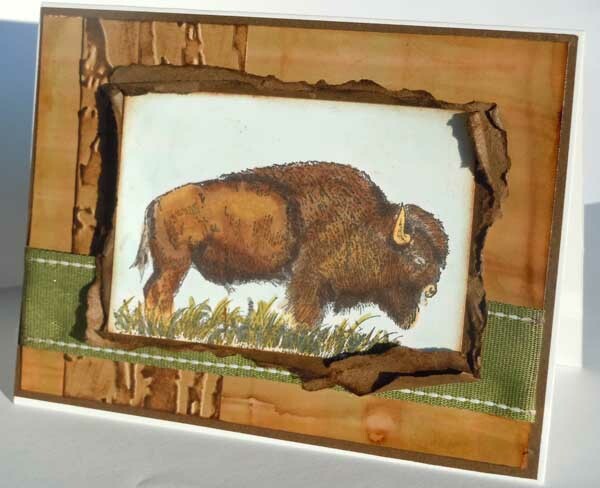 I am originally from Buffalo (actually a little town outisde the city called Cheektowaga) so images of Buffaloes or Bison evoke feelings of home and childhood. It is hard for people who are not native Buffalonians to understand, but that is one city that has a sense of identity. So, of course, when I saw this Buffalo from Stampin' Up!, I needed it. If for nothing else, for birthday cards for the men in my extended family. This card is exactly that. A birthday card from my Brother-in-law. Who now lives in Albany, but has Buffalo in his heart. My Buffalo card uses the plaid technique (December 2010 issue of the Technique Junkie Newsletter), which I diffused slightly to soften the effect. The Buffalo was colored with Copics, and layered over Torn Frame (December 2008 TJNL). 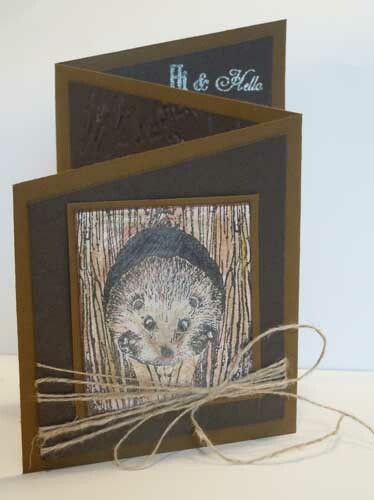 A strip of highlighted texture completes the card. If you have a connection to Buffalo, give me some love!